‘We’re the pretty ones now,’ Allister Ashmead of Elderton said to me once, in relation to his newly-elegant Shiraz. Who’d have thought to hear an Aussie, a Barossan, say that? Matthew Jukes’ extraordinary 100 Best Australian Wines tasting this week has confirmed to me that Australian Shiraz has graduated to a new and sublime level. And it seems absolutely right – as if the best producers of the Barossa, McLaren Vale, Clare, Coonawarra and the rest are simply taking the next step on an evolutionary journey. Oh, there are some monsters still (and I mean that as a compliment). 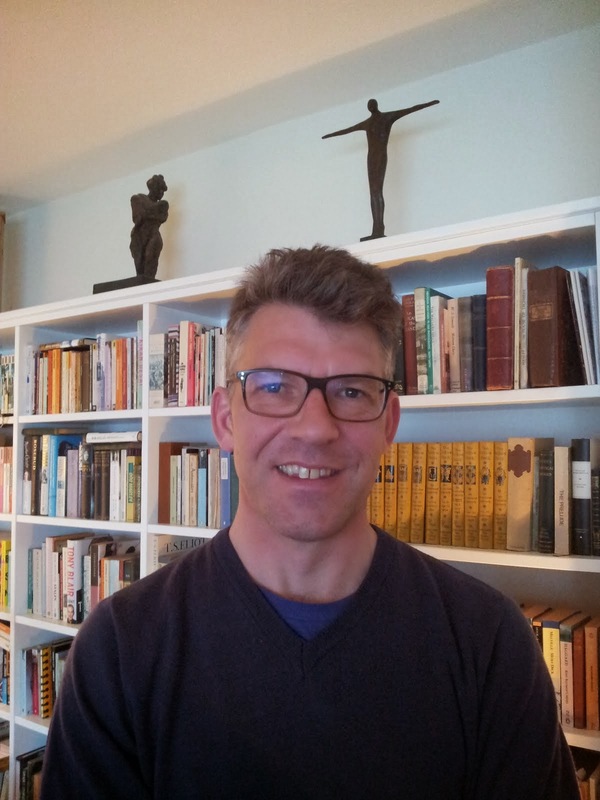 But the mighty ones – Ben Glaetzer’s Bishop, Grant Burge’s Meshach (the old testament names put you in mind of those stiffbacked pioneers in their rusty black hats, beards full of grit) – sit comfortably in their skins. They are behemoths, but they’re balanced and practical, there’s no alcohol burn, and the tannins don’t rip your teeth out and kick them down the street. But before we got to those there was a line-up of excellence. Jukes knows what he’s doing of course (though no Elderton? ), he should do, he’s been at it long enough – this is the 10th anniversary of the 100 Best, and the big hall at Aussie House was packed. Back to the Shiraz. I haven’t used the word ‘delicate’ so much since I was reviewing Dresden china for Tea Service Weekly. Wine after wine was bold, bright, uncompromising but not brash. The thread that ran throught the 30-odd I tasted was the quality of the tannins. Typically a nose of ripe plums, bruised damsons, white pepper (not black so much, as it used to be), savoury grilled meats and so forth, repeated on the attack and then quickly picked up by a delicate (there we go again) but firm wave of ripe tannins, dry at first then explodingly juicy, and carrying right through to the end. They are such complete wines. There is no fatigue (although I did trip over the fluted columns a couple of times), just a constant pleasure in tasting wines that are crafted by artisans at the very top of their game. The difference between now and five or eight years ago is the tannin management. Big Australian Shiraz could make you feel you’d just drunk a glass of sand laced with mint and juicy berries, but no longer. These wines have tannins that are tough and muscular, there’s no doubt about them, but they don’t dominate except in a couple of cases. Then there's the freshness of beautifully-balanced acidity, sitting alongside the tannin and fruit, adding to the mouthfeel. This is the new Shiraz. The pretty ones. What a superb selection of masterful wines. More earth and general deliciously rotted forest floor on the nose. Brilliant nose. Cooked macerated plum, damsons, chocolate, coffee notes. Very complex, could go on smelling this for minutes on end. The palate is the same, with very precise tannins holding up more plum and dark stone fruit. The length is perfect: warm, powdery tannins which finally dissolve into juiciness and don’t disappoint for a full minute. Superlative wine – and what a price! I’d tasted the altogether more expensive Michael and John Riddoch with Sue Hodder that morning… This has sweet definite red cherry and blackcurrant on the nose – very pure – then a ripe rather commercial (though not jammy) palate. But as soon as you start thinking, ‘commercial’, the tannins kick in and lift everything out of easy sweetness and into more serious territory. Great length. Very good. Not a cheap wine, I have to say, and a disappointing end to the palate for the price. The Viognier adds a layer of parma violets to the nose, and there are velvety sweet violets, along with blackberry and white pepper. But ‘celestial’, Matthew? The only celestial thing about it is the price. There’s unbalance here – nothing serious, but within this lineup the tannins lack juice. Open spicy peppery classic Aussie Shiraz nose, mint and menthol at the end. Tannins are old-fashioned monsters, but they don’t overwhelm the superb earthy dark fruit flavours. Until the end palate, when they’re drier than I’d like in an 09. Are they going to get any softer? Mint and eucalypt, white pepper and plummy dark fruit. Tannins full of power and grip, but charming for all that. Old-style muscular Shiraz. Good. Wonderful wine, fine blackcurrant and sweet plum on the nose, carrying through to the palate, picked up and rocked by sinuous, gritty tannins that remind you to eat a very large, very juicy rare steak with sea salt and black pepper, immediately. An old charismatic monster. No note! What happened? Must have been distracted. Pity as I love John Duval’s wines and had clocked this one earlier. What does Matthew say? ‘Grunt and more spice overlaying the chocolate, plum and mulberry theme… oak exotic…’ Damn. Superb and muscular, a wine for laying down for a dozen years before you even attempt it. But the tannins on this 2007 are ripe and sweet and rather kind to your back teeth, the fruit is open and opulent, with an almost Grenache-like juiciness before the tannins grab you and usher you firmly into another world. Very fine. From the immensely talented Ben Glaetzer, a beast. Brooding meaty nose, savoury, with sour-mash plums, licorice, dark berries. Sweet densely-knit tannins carry more plumminess and damson, chocolate and more licorice. Huge, and with a slight alcohol burn (only 15.1%) at the end, but then it’s very young and we can forgive that. Sweet dense nose loaded with chocolate, leather (old saddle leather), tar, dark fruit. There’s such elegance here for a big wine, the dark fruit palate carried by ripe tannins that carry it all the way to the end. Brilliant. More tar, sweet and pungent, rotted dense plum, molasses, wonderful perfume. Very ripe, very beguiling in a massive way. The tannins are ripe and powdery, exploding into almost viscous juice on the end palate. My last wine of the day and what a send-off. Kareem Massoud shrugs a shoulder when I mention how the Californians tend to dismiss New York wines. ‘They would, wouldn’t they?’ he says. 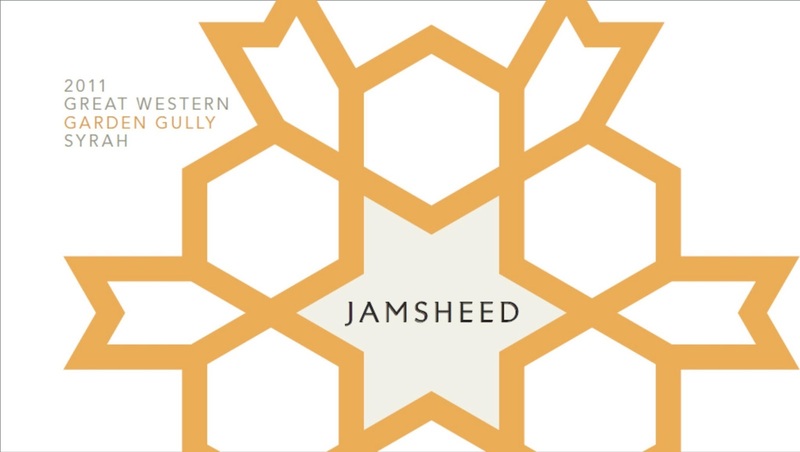 Massoud is the winemaker and owner of the excellent Long Island winery Paumanok; he and half a dozen of his east coast colleagues are showing 70-odd wines at the London Wine Trade fair (or village fête, which is what this truncated event has come to resemble). Still, I wasn’t complaining. Everyone’s relaxed, you can get to talk to the winemakers, and you can taste and take notes without being jostled by fellow-travellers. I’ve never been to New York State wine country. I’ve hardly ever tasted their wines. We don’t get to see them in the UK, really. They enter a handful of wines for the Decanter World Wine Awards every year, and win a few bronzes, perhaps a silver medal. They're just not very visible. So it’s been an education to see their range (and Virginia as well, of which more later). New York State sits between the 38th and 48th parallels – the same latitude as most European wine country (Bordeaux is on the 44th parallel, southern Spain goes down to the 38th). It’s a region cooled by vast bodies of water – the Atlantic to the east, the Great Lakes to the north and west. Soils are deep and well-drained, varying from the slate, clay, sand and silt of Finger Lakes to the sandy well-draining soils of Long Island. 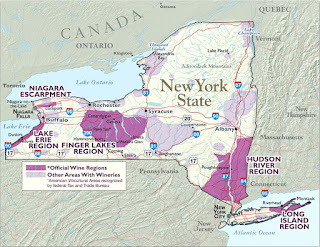 The Finger Lakes region is the oldest and best-known – for its Rieslings, then there’s the Lake Erie region to the west, Hudson River above New York City, and Long Island, its producers concentrated on the two forks at the east end of the island. New York State is a huge region, second only to the behemoth California in US wine production, with some 1500 growers and 309 wineries in nine AVAs. The list of grapes farmed is long, from the recondite (Baco Noir, Chancellor, Marechal Foch, Valvin Muscat, Catawba) to international staples (the Bordeaux varietals, Chardonnay, Gewurz, Pinot Noir, Riesling). If you want to find the wines in the UK, the best importer is Wine Equals Friends, which lists around 70 wines. Most of them are on-trade – a few dozen restuarants around the country, including some top names: Arbutus, The Glasshouse, Hakkasan, Hedone, Hix Mayfair, The Modern Pantry, Pollen Street Social, Gidleigh Park, Nathan Outlaw, the Seafood Restaurant, Padstow and others – including of course the Vineyard at Stockcross, which has the most comprehensive American wine list in the country. The wines aren’t cheap – hardly any clock in at less than £15, with the average seeming to be £18-25, and the big icon reds and whites hitting £40-45. For the on-trade the wholesale price starts at £18-odd, so on wine lists you’re going to be looking at £50-60 bottles at least. It was a fascinating tasting, every wine a pleasure, none that I wouldn’t recommend. If you take as the benchmark question, Is this the best expression of this grape, for the region and the terroir? Then I’d say the Bordeaux blends stand above the rest for their complexity and finesse. The reds seem to me to bridge the Old and New Worlds – they have elegance and precision along with exoticism. Tasted blind, you’d say unmistakably New World. The Rieslings are lovely, but in some I thought the sweet aromas on the nose promised much, but the follow through would be slightly dry. Often the acidity didn’t dance on the palate alongside that lemony fruit, but fell to a dry shortness. This is only a snapshot. I only tasted one Pinot and didn’t think much of it, but that’s hardly representative. I didn’t have time for the Chenins (I would have loved to see them) or the Chardonnays, the ice wine, the late harvests, the Gewurzes… what a cornucopia. New York (and Virginia) play second fiddle to California, which has the market and the reputation, and the bombast. And as the Californians find more and more elegance in their Cabernets, as those reclusive hillside growers shake the dust off their boots and make a bit more noise about their wonderful Mountain Cabs, New York’s not going to find the going any easier. Can they find a market in the UK? I don't know - we've got a blind spot when it comes to American wines.We just don't get them, in more ways than one. A joint venture between three vineyards - Anthony Road Wine Company, Fox Run Vineyards and Red Newt Wine Cellars. Honeyed fruit with white flowers, good dense acidity, quite dry, full of character. Bright spicy lemon and lime (lemon meringue pudding, with that touch of creaminess), palate full of bright exotic tropical fruit, racy (but slightly drying) acidity. Red Newt Cellars, Sawmill Creek Riesling, Finger Lakes 2011. This winery produces around 400 cases a year. Interesting grassy aromas and dense petrol notes on the nose. It gives an impression of a serious wine, mineral, elegant and light, with flavours of cut pear, hints of honey and aromatic citrus. 2011, Massoud says, was one of the most challenging he’s known, with heavy rains from mid-August to harvest, disease, rot and other horrors to cope with. So if he can make Cab Franc like this in a bad year… it has lovely bright fruit on the nose, almost Grenache- like in its juiciness, and good powdery tannins which burst refreshingly on the end palate. A pretty, charming wine. This superlative Merlot has the same earthiness on the nose as the Palmer Cab Franc, with sweet cooked plum and soft red fruit – raspberries and sweet balsamic – on the platate. Superb, youthful, with grippy, supple tannins. (Martin, winemaker, see above, describes them as ‘elastic’, which is spot-on – elastic implies higher tension than suppleness.) Excellent. Lovely grassy flavour on the nose, those cherished herbal (‘erbal) notes. Sweet cherry and damson palate, superb defined, precise tannins. Very fine indeed. Good juicy sweet blackcurrant then ripe, cooked raspberries on a base of precise minerality. Very fine spice and perfume (cloves, pot pourri). An exotic wine, almost eastern-Mediterranean. Very fine, moderate, balanced, food friendly. Blackcurrant, damson and dried plum nose, then the Petit Verdot giving pot pourri and aromas of quince paste, then (complexity!) (h)erbal notes. Palate has fresh raspberry, red cherry and red plums, and some cinnamon, coffee, all set off by fine tannins that carry through to a sharp, food friendly finish. One of the best I’ve tasted from the region. International consultant Stephane Derenoncourt has caused a minor controversy by saying that he puts his wines through a 'special preparation' for En Primeur – but there is little unusual in that, Bordeaux vignerons and proprietors say. Derenoncourt has told Le Monde newspaper his method was to take small portions of ‘each parcel and put them through a special process to speed up the elevage’. The wines are put into barrel earlier than normal, straight after running off, ‘so that the marriage between the wines and the wood may happen more naturally’. Most winemakers in Bordeaux that I spoke to said the practice of speeding up the elevage by putting the wines into new wood early is perfectly common. Only one – Yann Bouscasse of Chateau Cantinot in Blaye – admitted different journalists tasted different barrels. Certainly true (Maltus is outspoken and has a reputation for honesty). But any winemaker makes it perfectly clear that of course he's going to present his wine as best he can for En Primeur. You'd be daft not to. Henri Lurton at Chateau Brane Cantenac in Margaux said there are many different ways of putting samples together for En Primeur. The idea of a special preparation for en primeur, though, is quite straightforward. An en primeur échatillon is far more likely to come from 100% new oak, even though final blend will be only a small percentage of new oak, simply because the wine matures far quicker in new oak than in second- or third-use barrels. Similarly vignerons will favour certain coopers over others for the En Primeur sample. ‘Some coopers show nicely early and some show better after ageing,’ Dubourdieu said. Philippe Magrez of Bernard Magrez, owners of Chateau Pape Clement and some 20 other properties in Bordeaux, said that the blend shown at en primeur may come from selected barrels. What many are adamant about is the logistical difficulty of producing ‘special’ barrels. Alexander van Beek, who runs Margaux third growth Chateau Giscours, said ‘blending is a nightmare’ for the sheer number of variables they are dealing with. Only one proprietor – Yann Bouscasse of Chateau Cantinot – admitted he gives different journalists different wines depending on their perceived tastes: American journalists or those working for American publications are shown samples from new oak barrels while Europeans get samples from second- and third-use oak. But Bouscasse, along with everyone else, stressed that the final blend that goes into bottle comes from all the barrels. The common thread that unites all those I spoke to was the fact that while it is possible to produce special cuvées for En Primeur, selecting only the very best parcels, it is a strategy fraught with difficulty. For a start, the blending process is so complicated in the first place – as van Beek said – this would just add another logistical headache. ‘Of course you can take the very best if you are only making a few barrels, but when you have to make1000 barrels it’s very different,’ Magrez said. 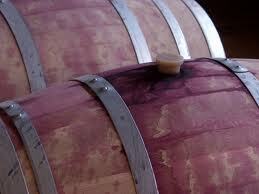 ‘To take only the best barrels would be dangerous because the wine would not be the same after 12 months.